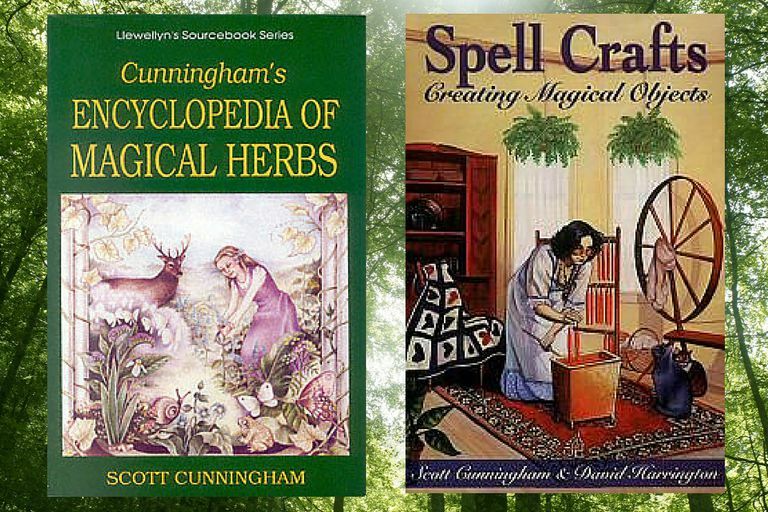 Author Scott Cunningham (June 27, 1956 - March 28, 1993), created dozens of books on NeoWicca and modern Paganism, many of which have been repackaged and reprinted, expanding his catalog of work after his death. Born in Michigan, Scott spent most of his life in San Diego, California. In high school, he discovered Wicca and was initiated into an eclectic Wiccan coven. In the early 1980s, he spent some time in a group led by author Raven Grimassi. It was from these experiences that Scott drew much of the information which was passed along in his books. While Cunningham often comes under fire from lineaged Wiccans, who point out that his books are in fact about NeoWicca, rather than traditional Wicca, his works typically offer a lot of good advice for people who practice as solitaries. He frequently points out in his writings that religion is a deeply personal thing, and it's not up to other people to tell you if you're doing it right or wrong. He also argued that it was time for Wicca to stop being a secretive, mystery religion and that Wiccans should welcome interested newcomers with open arms. Interestingly, Scott was able to take his knowledge of natural magic and translate it into language that beginners to Wicca could easily understand. He shared his belief of the Divine, and of symbolism, and although he never dumbed it down, he managed to take complex information and explain it in a way that someone who had no prior understanding of Wicca could still absorb. It was this skill, perhaps, that made him one of modern Paganism's most popular writers. Even fifteen years after his death, Scott Cunningham's books continue to sell in bookstores around the world. In 1983, Scott was diagnosed with lymphoma. He suffered from a variety of illnesses over the next decade, including meningitis, before passing away in 1993 at the age of thirty-six. Following his death, much of his material was repackaged by publishers and re-released posthumously. Sam Webster at Hermetic.com says of Cunningham's writing style, "This is the encyclopedic approach which serves to gather into one location qualified source material and thus becomes a reference work against which other sources will measure themselves. If nothing else, the ability to organize this information into a form we can access is profoundly creative, and we are doubly blessed that Cunningham was a careful researcher so that we can have some faith in the information he gathered. Time alone will give us the real measure of Cunningham’s writings, but the foundation he built is solid." For a detailed and personal look at the life and untimely death of Scott Cunningham, I highly recommend reading Whispers of the Moon, which is a biography written by David Harington and DiTraci Regula.